We recently got a great question from a prospective customer. The question was about how "clean" the stimulation signal of the XCSITE 100 is. Before we proceed to answer this questions, let's backtrack for a second and discuss what this question means and why/when it is important. Transcranial alternating current stimulation (tACS) applies a sine-wave electric current. As you may remember, a sine-wave has a fixed amplitude and frequency. For example, 2mA 10Hz tACS would refer to the stimulation current being a 10Hz sine-wave with a (peak-to-peak) amplitude of 2 mA. 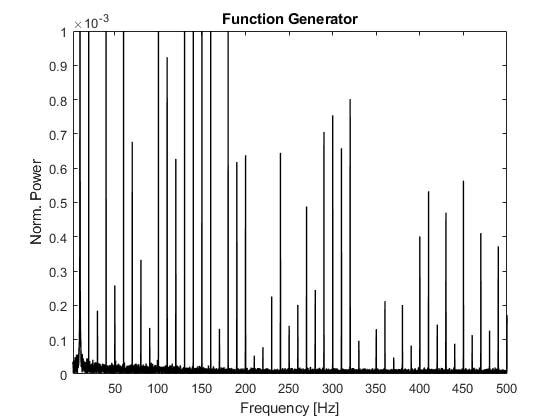 One way how to describe the oscillatory structure of signals is to compute their spectrum (e.g., by using the Fourier transform or wavelet analysis). The spectrum is a plot where frequency is on the x-axis and the strength (amplitude/power) of different frequencies is plotted on the y-axis. 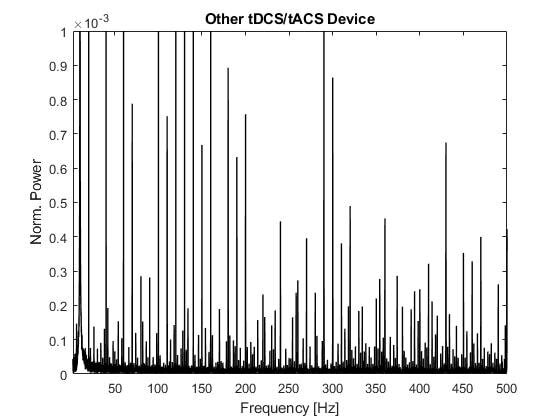 So, for 10Hz-tACS, the spectrum would (ideally) have single line at 10Hz and nothing anywhere else since the signal only contains a 10Hz waveform. In reality, this is not the case for various reasons, including electric noise, signal distortion by nonlinear properties of eletronic components etc. What we expect is a peak of the spectrum at the stimulation frequency. Often, there are small side-peaks at the harmonics of the stimulation frequency. 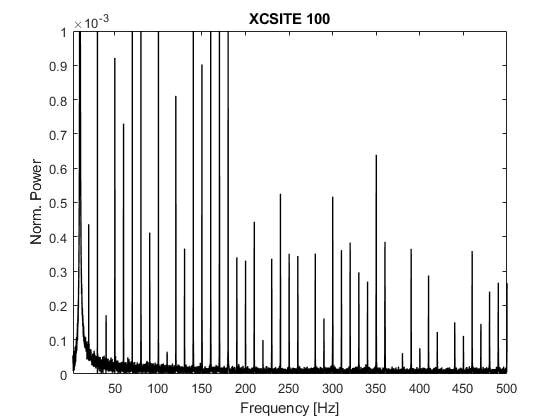 Here is the spectrum of the XCSITE 100 measured across a 3kOhm resistor. As explained, there is one and only one strong peak exactly at the stimulation frequency. The plot to the left shows that. The plot to the right is a zoom in to show how accurate the stimulation frequency is. ,Now, do these differences matter? We would think in most cases all this does not matter since the vast majority of all stimulation energy is exactly where it should be. However, if you have very specific needs in terms of signal quality, for example when recording EEG during stimulation, the specifics may matter since, albeit all these extra peaks are tiny, they will still be much larger than the measured brain signals. Please reach out to us if you have any questions about XCSITE 100, measuring and quantifying stimulation waveforms as we have done for this post, or anything else about non-invasive brain stimulation. We look forward to hearing from you. As a service to the community, we plan to announce events that may be of interest to your customers, such as workshops and meetings. If you would like us to post an announcement, please contact us. Today, we are delighted to forward the word that registration is now open for the Carolina Neurostimulation conference (May 21-23 in Chapel Hill, NC). Small Print: Note that this conference is independent of Pulvinar Neuro LLC. The only link is that our CSO directs the Carolina Center for Neurostimulation, which organizes the meeting. Pulvinar Neuro does not contribute to, influence, or endorse any of the meetings listed here. It is with great pleasure that we invite you to participate in the 1st Carolina Neurostimulation Conference (CNC) to be held May 21-23, 2018 in Chapel Hill, NC, USA. This is a premier conference for those working to advance our understanding of dynamics of the brain, body, and behavior, investigating the response to stimulation, and translating discoveries into clinical applications. Hosted by the Carolina Center for Neurostimulation, CNC serves as a platform for networking for all researchers and specialists and exchanging ideas about the latest discoveries and innovations in brain stimulation and clinical treatments. We have a great lineup of speakers including keynotes from Dr. Sarah Lisanby (NIH) and Dr. Kaspar Schindler (Inselspital). Central topics for discussion and presentations include TMS, tACS, tDCS, and methods such as modeling, imaging, analysis, and devices. For a full program, and information regarding registration, travel, and accommodations please visit our conference website. Like us on Facebook for updates. In addition to attending the plenary sessions, registrants are invited to participate in the conference’s poster session. Original contributions addressing theory, research, practice, and training/education issues, in any areas of neuromodulation and brain network dynamics are welcome. The deadline for abstract submission is March 15th 2018. Authors will be notified of acceptance in the first week of April. Please follow the guidelines for the submission of your abstract. Max 500 words and 1 page including title, author(s), affiliation(s), and main body. Trainees and conference attendees are encouraged to attend the preliminary neurostimulation workshop on May 21st, 2018. This one-day innovative hands-on transcranial electrical stimulation (TES) workshop will be taught by Dr. Flavio Frohlich. The workshop will focus on transcranial alternating current stimulation (tACS) and transcranial direct current stimulation (tDCS) with an exciting overview of theory, research, and methods. Click here for registration information. When completing registration, please be sure to provide feedback regarding your current knowledge of TES as well as some questions or techniques you are interested in. We want this course to be as interactive as possible. Lunch and beverages will be provided. Now featuring screenshots from our very cool app that controls the stimulation device. Learn more about the unique features of XCSITE 100. Tell us if you know of any other research-grade device that is that user-friendly! Double-Blind tDCS/tACS Studies: Why does it have to be so hard? (1) Can I do double-blind stimulation or do I need to spend extra money (per study?) to get this device feature? (2) Can I include any number of different stimulation paradigms in a study or am I limited to a single active and a single "placebo"/"sham" condition? (3) Can I use "active placebo", where brief stimulation is applied at the beginning of the sham stimulation to enhance the chance of successfully blinding the research participant? (4) Can I use the same device for multiple studies or are the devices only programmable for a single study at the time? (6) Can I freely assign my own study codes or does the device always use the same codes that any smart study coordinator will have memorized over time and likely associated with corresponding stimulation condition? Our XCSITE 100 devices was designed to address the above concerns (and some more). Our goal is to offer a cost-effective tDCS/tACS solution that advances the field since it let's you perform high-quality stimulation trials. Compare before you buy! We are proud to contribute to a workshop on theory and practice of tDCS/tACS on May 21st 2018 just before the Carolina Neurostimulation Conference in Chapel Hill, NC. Registration will open soon, both for the conference and the workshop. Dr. Frohlich will be the main lecturer (in his capacity as Director of the Carolina Center for Neurostimulation). In addition, we will have several other guest lectures on applied topics. Perhaps most importantly, we will practice tACS/tDCS and learn all the technical little tricks that make such a study successful. please note that this is a course for researchers and research trainees. What is a good study design for a tACS/tDCS study? What type of questionnaires are needed? How can we make a study truly double-blind? What are the common pitfalls of study design? What do we know about the mechanism of action of tACS/tDCS. Are we ready for the rational design of stimulation paradigms? Is the field in a crisis? How should we move forward as field. What are the high-yield, high-priority research areas in our field? How can I apply stimulation without dripping saline, unstable electrode impedances, and truly gross sponge electrodes? Learn how to do it better! This will be very informal and interactive - we look forward to seeing you there! PS Pulvinar Neuro will provide the devices to practice. This is an academic event and none of the lecturers receive any financial remuneration from Pulvinar Neuro. The content of the lectures will be without commercial bias. You should use the stimulation brand you like best and works best for your research! Use of XCSITE 100 as a clinical device (at home)? We only sell the device to researchers, for regulatory reasons. So if you are a patient interested in tDCS/tACS, we are afraid we are unable to help since there is no FDA clearance of tDCS/tACS for the treatment of any disorder. You will find private practices that offer tDCS and also some older tCS devices that got grandfathered in by the FDA when they started regulating medical devices in seventies. All this is outside the scope of our company. Use of XCSITE 100 as a research device (at home)? If you are a researcher and would like to study tDCS/tACS at the homes of your study participants, our answer is a qualified "yes". The device is easy to operate thanks to our (what we think very smooth) app and the research mode, where any type of stimulation can be manually configured, is password protected. In essence, you need to trust the participant enough to use the provided stimulation codes as prescribed by you. You can go and use the encrypted log files to verify correct use of the device (at least in terms of the stimulation applied). In other words, if you trust your participants, this could work very well! What are you thinking when a researcher applies electrodes to your scalp and tells you that the device may change your brain activity? How about if this is a trial to investigate the effect of tDCS on depression? Well - the short answer is that the situation will consciously and subconsciously affect your thinking - the placebo response! It thus is an absolute imperative that tDCS and tACS studies include a "sham" or placebo condition. This makes sure that both participant and study personnel can never be sure if stimulation was actually applied or not. For this to work, though, you need blinding. One simple way would be to have different devices but that is cumbersome and expensive. More ideally, you have different codes that are linked to the stimulation parameters but the table that lists which code stands for what is locked away. Simple enough? Can your device do this? Can you specify new codes for every study? Can you set them up or do you need to send your device to the manufacturer? Think about it. These are the kind of issues that prompted us to design XCSITE 100. At the heart of it is a table that you can create for your study. Every row in this table contains a code and the stimulation parameters linked to this code. Do you want to do a study where every single person gets a different stimulation paradigm? You got it! You can have as many of these files as you want and you can thus use one device for as many studies as you want at the same time (well, it can only apply stimulation to one person at the time, but you know what I mean). There are also small other things that make a big difference. Do you want to know if you still have juice in your battery? Of course, you demand that feature for your convenience! But then, hold on, have you noticed that the battery is still almost full after a placebo stimulation session but half empty after a "verum" (real) stimulation session. If you have not noticed, I am sure one of your smart students / research associates / study coordinators has understood this. Now I think this can introduce a major bias in the interaction with study participants, especially in treatment studies. So no, we will not tell you if the battery is half empty or not. We simply give you ten rechargeable batteries and ask you to use a new one for each session and then charge them all together with our nifty 10 bay charger. BTW, whatever device you are using, please do not use one-way batteries for the sake of the environment but of couese first check with your supplier. There are more examples like that but I am sure you get my point. Let's make sure we use devices that have smart engineering to enable flexible double-blind study designs and that have engineering controls to avoid accidental unblinding.